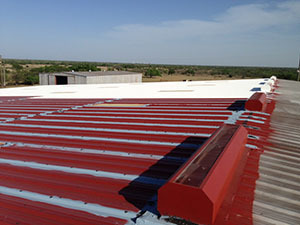 Building owners and property managers in the Texas panhandle whose facilities have metal roofing systems already know their roofs are tough and durable. However, just like any roofing system, metal needs to be maintained and requires the occasional repair. 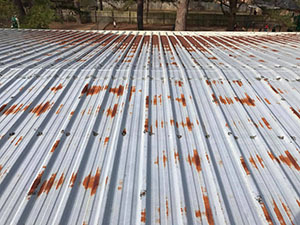 For over 20 years, ACR Roofing has been providing high quality metal roof repair services to residents of Brownfield, Texas, and the surrounding areas. If your metal roof is in need of repairs, give us a call today at (806) 712-8162. The expert roofers at ACR are trained to carefully and thoroughly inspect your metal roof and spot any weaknesses or potential issues. With regular, professional maintenance, you can expect your roof to last well beyond its projected service life, while avoiding major problems. ACR Roofing is a member of Choice Roof Contractor Group, a nationwide group of commercial roofing contractors who uphold the highest industry standards. That is why we use metal roofing solutions manufactured by Conklin for all of our metal roof repairs and restoration jobs. Choose from our full lineup of products, including Rust Off, Metal Ready Universal, Spunflex, Rapid Roof (III and IV), Benchmark, Equinox, and PUMA XL. Whatever you choose, you can count on a long-lasting, aesthetically pleasing solution to all your metal roof’s issues. We at ACR Roofing know metal roof repair. From small, localized repairs and patchwork to full-scale metal roof restoration, we can do it all. Call us today at (806) 712-8162. One of our team members can address your concerns over the phone and give you a free, no-obligation estimate for the best solution or schedule an on-site consultation with one of our highly-trained professionals.